Lady Lunafreya Nox Fleuret is a Character in Final Fantasy XV. Luna made many fond memories with Noctis in their childhood, but their days of innocence ended abruptly when the empire overtook her home of Tenebrae. Through adversity, she became the youngest Oracle in history. Adored and respected the world over, she now travels in search of communion with the gods to aid Noct on his journey. 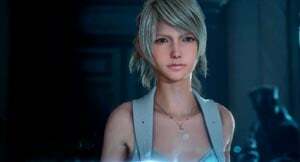 Combat skills and mechanics, roles and strategies for Lunafreya go here.